In early 2019 an educational program of the Permanent Secretariat of the World Summit of Nobel Peace Laureates, titled “Leading by example” will be launched at the Colombian University IPAZUD. The Educational Curriculum for adoption in University Courses was developed by the team of the Summit in the last two years building on the proven success in connecting youth to the teachings and courageous examples of Nobel Peace Laureates. The course at IPAZUD will be taught for all undergraduate students of the University from all faculties signed in for the course. To the moment the university has several dozens of students enrolled in the program. 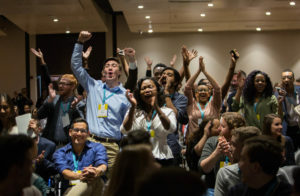 The curriculum is based on a fifteen-week education model and has been developed and reviewed by doctoral-level professors from all over the globe, with feedback from professors attending the World Summit of Nobel Peace Laureates. The curriculum brings to the classroom real-world scenarios in which students are engaged as leaders, responding to a range of global challenges that the world faces today. Specially designed for university courses, the curriculum provides flexibility so that it may be adopted appropriately and freely within any given classroom setting. 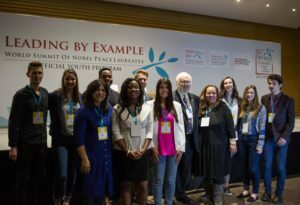 The program Leading by Example is built around the examples and activities of Nobel Peace Laureates and teaches students that every person can make significant changes in the local community or become a social leader and a key figure on the international field of peacebuilding. During the program, students learn more about the peacebuilding movement and activities as well as have a unique possibility to develop their own social project with the support of the course mentors. These projects help students to be directly involved in the positive changes in their local or even national community. The Permanent Secretariat along with global peace leaders support achievements and initiatives of the students.